For Mother’s Day weekend I made this lemon dream tart topped with fruit for our Sunday dinner as well as the lemon cream tartlets below for a dessert auction to raise money for our local farmer’s market. Because I used a gluten-free crust, I received many requests for this recipe. The recipe for the crust is from Oven Spoonful, a local catering company, who taught a gluten-free cooking class in my house for my birthday last year. 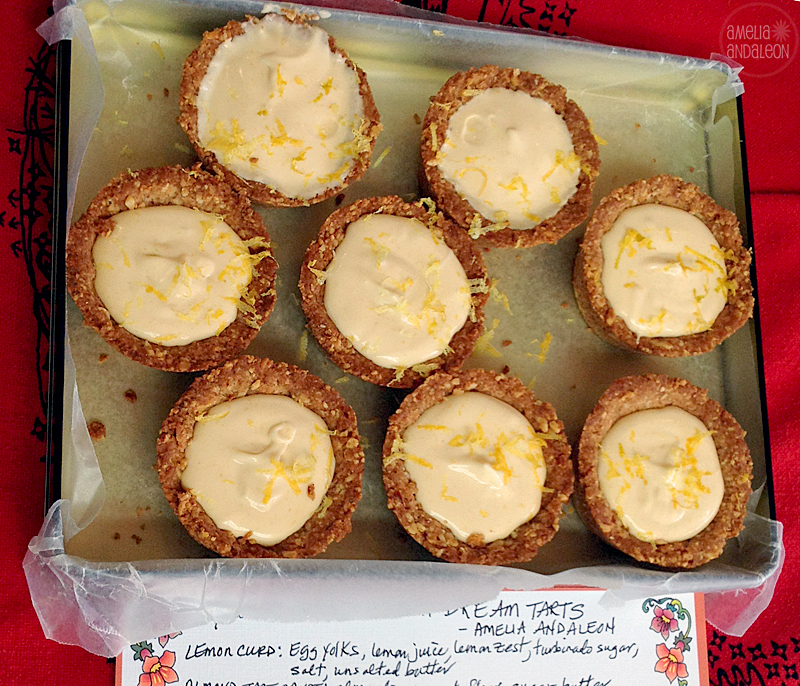 These lemon tarts were one of the highlights however, I did modify the recipe slightly which was a result of wanting more filling in my tart. Instead of just putting the lemon curd in the crust (which is tasty as-is), I folded in some whipped cream which made this my “lemon dream tart.” In the end, I actually ended up liking this filling better because it cut the tartness and even the sweetness of the lemon curd a bit. It also served to give me the volume I was looking for. And, the crust recipe is exactly the same. I am just adding some extra details to the instruction portion of this recipe. There are four recipes in this post: 1) lemon curd which you should make hours or the night before, 2) lemon dream filling, 3) gluten-free almond tart crust, and 4) fruit glaze. Here you go! Cook over medium=high heat, stirring constantly with a wooden spoon (be sure to scrape the sides of the pan), until the mixture is thick enough to coat the back of the spoon, 8-10 minutes, and registers 160 degrees F on an instant read thermometer. Remove saucepan from heat. Add salt and butter, one piece at a time, stirring until smooth. Strain through a fine sieve into a medium bowl. Fill your tartlets or tarts using the gluten-free almond crust below. OPTIONAL: top with fruit brushed with fruit glaze (recipe below) and dollops of whipped cream. Grate lemon zest on top. Whip the vanilla extract into your whipped cream. Fold this whipped cream into your lemon curd to your preference of puckerness or firmness; the whipped cream dilutes the lemon flavor and you may need more time for your filling to firm up. The filling will not be firm like a gelatin, it will be slightly soft because of the cream. But, it should not be runny. Fill your tartlets or tart and let chill at least an hour. Overnight is recommended. OPTIONAL: Top with fresh fruit and brush with fruit glaze (recipe below); if possible add the fruit and glaze as close to serving time as possible. It is also fine to add the fruit and glaze up to a night before. Bake at preheated oven at 350 degrees until nuts are toasted; in tart shells or muffin pan: 8-10 min., tart pan: 12-20 min. Let sit in pan(s) at least 5 minutes before gently removing tarts and transferring to wire rack. Let cool completely until filling. * This makes approximately 10 tartlets or an 8″ or 9″ tart. To make it easier to transport your tart, cut out a circle of parchment paper a little bigger than the bottom of your tart pan so that the paper goes up the sides a bit. Press your crust on top of the paper. * If you don’t have tart pans you can press the crust into an ungreased muffin tin; press halfway up the sides of each muffin cup. I used ~ 3/4 of a standard sized ice cream scoop for each muffin cup. When pressing the crust up the sides use a substantial amount to give your tart more structure and make it easier to remove from the pan. Your tart may crumble if the sides of your crust are too thin. To loosen from the muffin pan, gently use a butter knife in one spot to start the loosen and lift the tart out of the pan. * Baked tarts can also be refrigerated or frozen to be used later. Heat 1/4 cup of jelly with 2 tablespoons with water in a saucepan and mix until jelly is diluted. Cool completely before brushing glaze on your fruit with a pastry brush. * The fruit glaze is optional but, it adds a nice sheen to the fruit and it also adds some sweetness to fruit which may not be fully ripe. 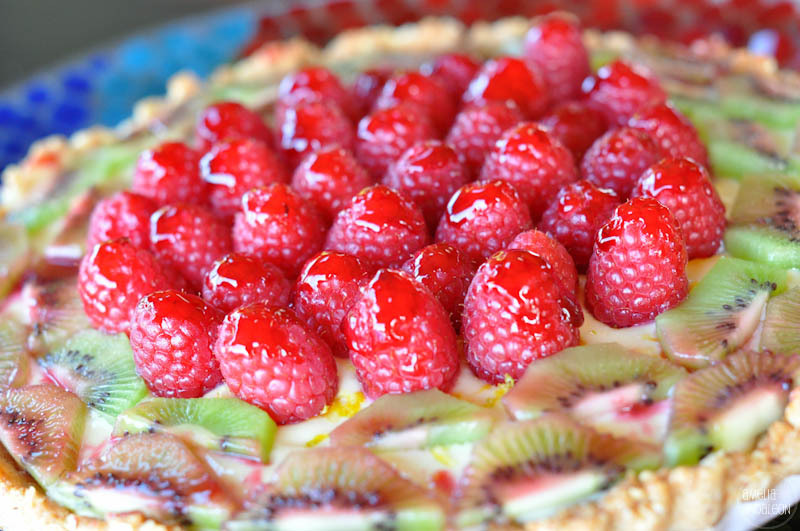 In the tart photo above I made the mistake of using a marionberry fruit glaze on the kiwi fruit. It was great for the raspberries and tasted wonderful but, a lighter colored jelly would have been a better choice for the kiwi slices. Maybe an apricot or apple jelly would be better for a lighter colored fruit glaze. When choosing a jelly, keep in mind the flavor of the fresh fruit you’re using and pick a complementary flavor and color. Enjoy these recipes. If you try them out, please come back and let me know how they turned out! Share your photos on my food photography flickr page here! This entry was posted in 365 Project, dessert, Food, food, gluten-free, Nikon D5000 Tips & Techniques, Photography, recipes and tagged 365 project, desserts, food, food photography, gluten free almond crust, gluten free recipe, gluten-free, gluten-free dessert, lemon curd, lemon tart, nikon d5000, Photography, straight out of the camera.